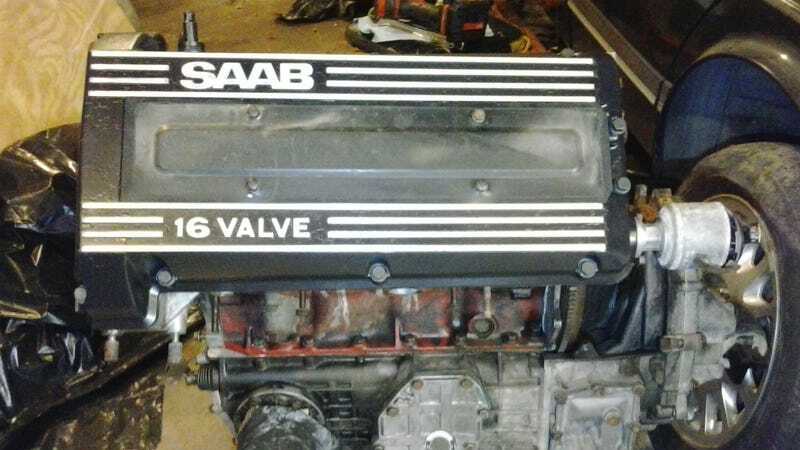 As badly as we need to continue repairing the Saab’s rust, we just couldn’t help ourselves but to keep putting the engine back together. As I’ve said before, this is probably my favorite part. We were getting tired of seeing the engine half-assembled, with bags and tape keeping the dust out. The rust repair was going to have to wait a little longer. After applying some high-temp primer and paint, the raised lettering and lines were sanded down to shiny aluminum. Everything was then finished off with a couple layers of high-temp clear coat. A lot of old paint had been peeking off, but some remained well-bonded to the aluminum. So there’s a bit of texture to the black parts of the cover. However, the shiny aluminum really pops now that it’s no longer a dull grey. My potato camera makes it look a lot worse than it is. But at some point, we will have to repaint the spark plug cover to do the rest of the valve cover justice. Before the intake manifold could go back on, we needed to reinstall the starter, oil filter housing, and water outlet. And of course the timing cover couldn’t be fully sealed without the oil pump and harmonic balancer assembly.